Each year Social Media Examiner hosts Social Media Marketing World which is one of the largest marketing conferences in the United States. This event which hosts over 3,000 attendees provides a great opportunity to learn, network and interact with some of the world’s top social media marketing experts. This year TopRank Marketing participated in this mega conference in a few ways. Our CEO Lee Odden presented insights into the future of influencer marketing to a packed room and team members Ashley Zeckman and Josh Nite live blogged top sessions and interacted with attendees. Marketing is changing, and rather quickly. This conference brought like-minded marketers together who all want the same things: To be cutting-edge effective marketers who educate and entertain their audiences while meeting the goals of their businesses, specifically through social media marketing. 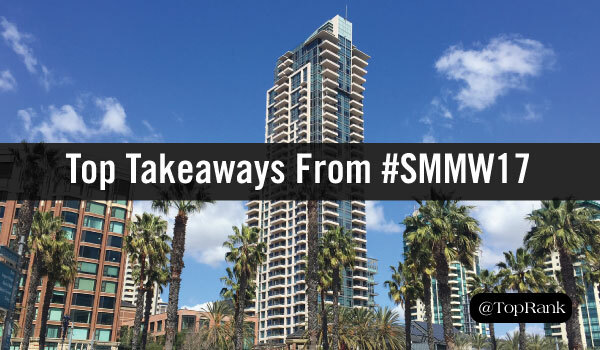 Below are some of our top takeaways from Social Media Marketing World 2017. Mari Smith, Top Social Media Influencer, Speaker, Author, Social Media Speaker & Consultant, and Facebook Marketing Expert shared tips and insights for dramatically improving your organic reach on Facebook. Team Organic Vs. Team Paid – This is no time to choose sides. One of the biggest issues that Mari sees with social media marketing is that companies (big and small) are segregating their social efforts. To see the best results, brands should implement social media company-wide and collaborate on their efforts. Video, Video, Video – Mari says that Facebook is moving towards television advertising. You better get on the train, because it is leaving the station. Videos are highly effective because they empathize with the audience, tell a great story, and are useful to the audience. Carlos Gil, Head of Social Media at BMC Software, shed light on a breakthrough game plan to crush the competition using Snapchat. Snapchat for Quarterback – With over 300 million users per month, Snapchat is head honcho for Millennials (approximately ages 18-34). In fact, Millennials make up 41% of the snapchat user profile. If your business’s main audience is Millennials, then snap the ball to Snapchat. Content that Wins – Since you only have 10 seconds to score with your audience, Carlos tells us to keep it real. Extra real. Show off employee successes, go behind the scenes, and rave about company culture. For products, tell a short product story. Snapchat could be the game-changer your company has been waiting for. Experiment with this social platform and see how it can work for you. Ann Handley, Chief Content Officer at MarketingProfs and author of Everybody Writes shared some tips to create “ludicrously spectacular” content. Ugly First Drafts Turn into Beautiful Swan Content – Just get words on the page. Don’t get overly thoughtful about how it comes out the first time. The first draft can be in many formats: lists, bullet points, fragmented sentences. There will be numerous rounds of edits and revisions to bring it together. Hook, Line, and Sinker – The first line will do one of two things: make your reader stop reading, or motivate them to the next line. The first line needs to lead your reader to the rest of the content. Make it clear and interesting. Content creation is no easy feat. Take it from an expert and learn how to turn up your content from drab to fab. Lee Odden, CEO & Co-Founder of TopRank Marketing, shared strategies to be the best answer for the future of influencer marketing. You Have to Invest to See Results – Many companies only spend 10% of their marketing budgets on influencer marketing efforts, which limits their collaboration capabilities. Companies need to change their mindset from implementing projects to implementing programs. Lee says it’s about long-term relationships, which will create the most value for your spend. B2B Falls Short – B2C companies have adopted this approach as a best answer for their marketing strategy, but B2C companies are slower on the uptake. Lee suggests starting by engaging expert help to research, identify relevant influencers, and develop a plan that aligns with ROI. Then activate your clients. As advocates for your brand already, invite them to co-create content, and amplify the top-performing content for further reach. The future of Influencer Marketing may be unknown, but it’s headed in the right direction. Thinking long-term and more about the relationship can make all the difference. Social Media Marketing, killer content creation and influencer integration are just a few of the topics we, among the thousands of other attendees learned about at Social Media Marketing World 2017. If you’d like help evolving your social media or integrated marketing program, contact TopRank Marketing today to learn how we can collaborate together to provide the best answer for your business and your customers! If you’d like to join our team of smart, creative, and results-driven marketing professionals, take a look at our open positions.